The State University of New York has named 11 SUNY Oswego students recipients of 2016 Empire State Diversity Honors Scholarships. The program of direct aid seeks to attract and retain undergraduate students to SUNY campuses who have demonstrated high academic achievement and can demonstrate they will contribute to the diversity of the student body. 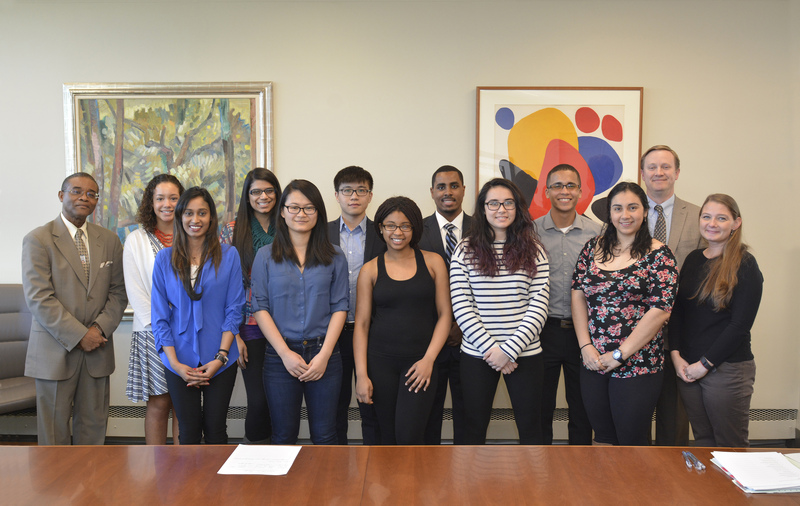 From left are Howard Gordon, executive assistant to college President Deborah F. Stanley; Madison Emily Marie Shaw, Gaitri D. Rodhan, Harleen Kaur Grewal, Cuifen Zhuang, Zhiqiang Ke, Autumn Caldwell, Kyle Anthony Martindale, Sequoya Anita Fitzpatrick, Yan Carlos Minaya, Katelyn Zheila Zhinin, Admissions Director Daniel Griffin and Jennie Hoffman of the Office of Financial Aid. Missing from the photo is scholarship recipient Sharon E. Lapointe.